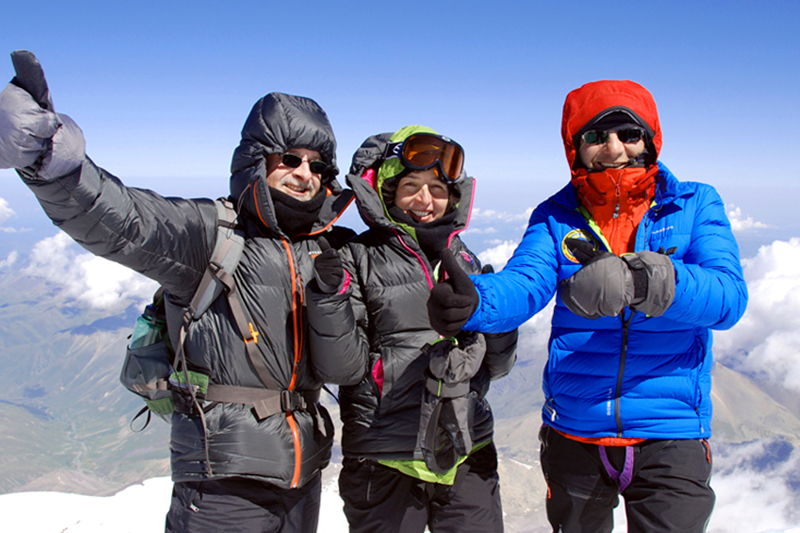 Mount Elbrus is the highest peak in Europe - one of the 7 summits of 7 continents. The West Summit, the higher point of this twin-summited mountain, is 5642m high and the East Peak - 5621m. Those two peaks lie in 1500m from each other and are separated by the saddle, 5400m high. Mount Elbrus is located in Russia, in several kilometres northern the main ridge of the Caucasus. The Main Caucasian Range is the geographical border between Asia and Europe, separating Russia and Georgia. Mount Elbrus is a former volcano. The last explosion occurred about 1500-2000 years ago. First climb of Mt Elbrus east summit was made by the Kabardinian guide Killar Khashirov in 1829 who was working for a Russian army scientific expedition. The west, and slightly higher summit, was climbed in 1874 by a Balkarian guide, Akhia Sottaiev, who was working for a group of English, French and Swiss climbers. Mount Elbrus is perfectly suited to relatively easy mountaineering (in the summer) or an exhilarating ski mountaineering trip (in the spring).